China's new "air defense identification zone" overlaps with Japan's, raising the risk of war in East Asia. UPDATE: On Tuesday morning Beijing time, two US B-52 bombers flew over the disputed Senkaku/Daiyou islands, "in a direct challenge" to China's new air defense zone, US officials have told the Wall Street Journal. To understand why East Asia is aflutter over the matter, it helps to look at a map. On the left, in pink, is China. Note the red line delineating a polygon, extending from its coast deep into the East China Sea. 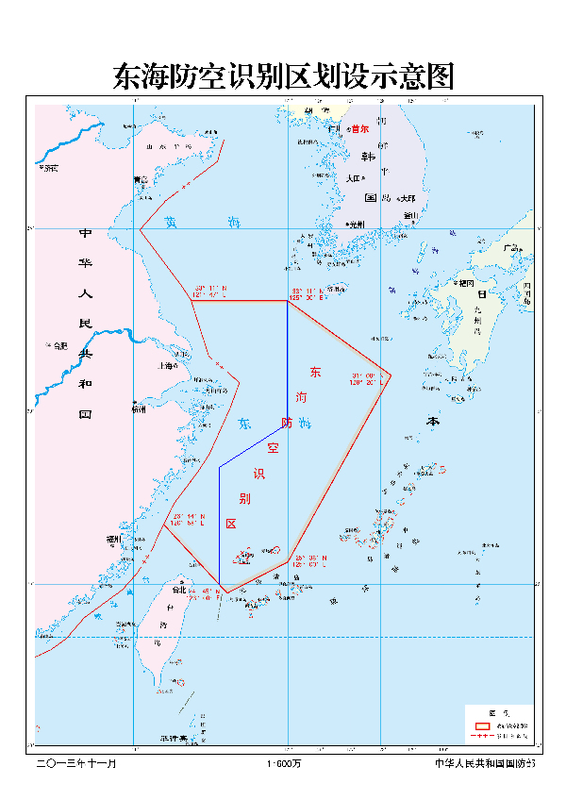 This is the area in which China claims that any military plane must identify itself and follow China’s rules or face “defensive emergency measures” from the armed forces. On the right, in khaki, is Japan. Its own blue line extends south, off the coast of China. This is Japan’s air-defense identification zone. In the middle of the polygon, over the Japanese-controlled (and China-coveted) Senkaku islands, these zones overlap. And it’s in this large area zone claimed by both countries where the risk for accidents and military conflagration has just gotten a whole lot worse. Not to mention that the United States, Japan, and South Korea all make routine military flights over large portions of the East China Sea that China has just claimed as under its control. In its defense, Chinese military experts have pointed out that 20 countries have air-defense zones — including America. To understand the risks and reasoning behind China’s gambit to change the status quo in the East China Sea, GlobalPost interviewed Carlyle Thayer, emeritus professor at the Australian Defence Force Academy, and an expert on maritime security in Asia. This interview has been edited and condensed by GlobalPost. GlobalPost: Is it correct to view this as a provocation? Do you think it will increase the risk of accidents and military conflict? Carlyle Thayer: Yes. It’s an air defense interdiction zone that goes over sovereign territory, Japan’s Senkaku islands. It creates huge confusions and risks and has been protested in various forms by Korea, Japan, Taiwan, and the US. Don't Japan and the US have their own "Air Defense Identification Zones"? Doesn’t China have a good case to make that it should also have an air defense zone? Sure, but they’re doing it on somebody else’s property. The US interdiction zone applies only to planes flying into the United States. It does not apply to plans flying through the US zone. The problem is mainly China vs. Japan, and Abe is not bending, and China does not like it. What you have here is a provocation, an escalation. It’s designed to upset the status quo. Partly it’s also playing with Japan’s mind. Do you really want to stand up for this, or do you want to stand down? It’s very calculated pressure. How does the US fit into this picture? China is trying to drive a wedge in the [US-Japan] alliance by saying, “You won’t go to war over a couple of islands.” The US position is when countries try to unilaterally overturn international law, they have a calibrated strategy of just ignoring it. The fact that it was [Secretary of State] John Kerry and [Secretary of Defense] Chuck Hagel who responded to China’s announcement — that’s pretty heavyweight. By the US coming in, it takes China’s challenge to Japan and raises the ante a bit. China is confronted. Do they really believe the US statement [that America’s defense treaty with Japan covers the Senkaku islands]? The response on China’s internet has been largely enthusiastic. The overwhelming response seems to be, “So it raises tensions? Good, better to let the Japanese know we mean business.” How do you expect this to play out? A lot of this is a charade, it’s a propaganda game. But it has risks. At the moment, given past behavior, I don’t expect any incident to occur. But it could. And that's the problem. Eighty percent of me is saying it’s just play acting, the other 20 percent is saying if you’re a desk officer, you have to expect the worst. How do we tell our pilots to react if they encounter the Chinese? If the Japanese turn tail, are they conceding sovereignty? This is what China is raising. It’s taking things into ambiguous territory. It’s math: you can’t have PLA and Japan armed jets over the Senkakus at the same time. If you do have them out there, what are the rules of engagement? What do you tell them to do? If a Chinese jet got shot down, what would China gain from this? It would have a propaganda victory of claiming to be a victim. But the larger picture is that this is not the time. China needs a peaceful environment to grow. I don’t think China wants this to lead to conflict. But no one can put the genie of nationalism back into the bottle.